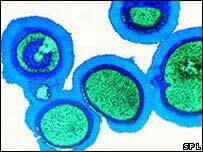 A vaccine to guard against hospital superbug MRSA is a step closer, according to scientists. US researchers have developed a vaccine that protected mice from four potentially deadly strains of MRSA. Writing in the Proceedings of the National Academy of Sciences, the team said the study could lead to a human vaccine, though more work was needed. Methicillin-resistant Staphylococcus aureus often strikes in hospitals where patients' immune systems are weak. It is difficult to fight because it has developed a resistance to certain antibiotics. The team looked for a vaccine using a technique called "reverse vaccinology", which builds on recent genetics advances. It involved sifting through the genome of Staphylococcus aureus to hunt for proteins on the microbe that might spark the body's immune system into action, producing protection against the bacteria. The team identified four proteins that prompted a strong immune response, making them good targets for vaccines. When they combined the different proteins and injected them into laboratory mice, they discovered the mice had gained protection against five different strains of Staphylococcus aureus. Four of these strains were MRSA, while the other was a strain associated with toxic shock after burn injuries. The vaccine gave the mice between 60% and 100% immunity. The team said further tests would be needed to understand the mechanism of the vaccine and to discover if it would be as effective in humans. Lead researcher Olaf Schneewind, professor of microbiology at the University of Chicago, said: "This microbe's ability to acquire the tools it needs to protect itself from the drugs we use to treat it is legendary, which is why a vaccine has become such a high priority. "One by one, this organism has learned how to evade nearly all of our current antibiotics. So, generating protective immunity against invasive S aureus has become an important goal." But Dr Jodi Lindsay, senior lecturer at the Centre of Infection at St George's, University of London, said: "I think this study has not discussed some important things. "The researchers did not look at a good cross-section of strains of MRSA - there are several families of MRSA, each containing many different strains, and the team only looked at a few US-specific strains." She added that, for a vaccine to be efficient across a number of different strains, the proteins used must be the same in every strain but the proteins used in the experiments varied. "It is also important to remember a mouse model is not the same as a human model. The hard bit is getting a vaccine from a mouse to a human, because that involves a lot of patients, a lot of money, a lot of regulation, and so far, the best examples have failed."